b3ta This page has multiple 404 images. These were submitted to the site during a recently held a competition in making the best 404. Some of 404s are PG13 or higher. Email entry. homestarrunner Has a hand drawn 404 with a sound clip stating that you have been 404'd. Links to help the lost user. Email entry. Republic of Letters Standard news page 404. Email entry. Mind Games Studio Has a 404 that states "Got Smack ... ", you can read the rest. Driving background beat and links for the lost user. Email entry. TechHomes.com Has HAL 9000 "eye" stating that your page could not be found. No classic 404 in the page, but has links for the lost user. Email entry. 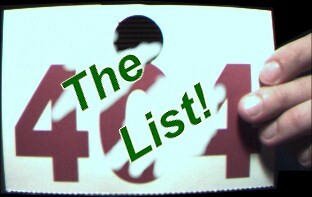 soomka No 404, red page with the following Bzzt. The page you tried to fetch doesn't exist. Get it right next time, hoser." web-glitter Does not have the classic number, but does state the File not Found. Graphical with, I think, an upset women on the page. Links for the lost user. cosmicoranges Graphical page with some nice looking oranges on it. Has the phrase You have mistyped the URL, or the page you are looking for does not exist. Link for the lost ones. ouchytheclown A clean, yet scary 404. Warning this is an adult site. Clicking the link on this page may offend. Email entry. notfunny.org Not a real 404 page yet, but soon. Has an entry form so that the lost ones can enter in a message that will be added to a list. Messages are randomly selected from this list and used within the 404 page. Be warned, some messages may not be kind to the eye. Has the classic 404 and a link to the front page. Email entry. kurumi Has a highway sign with the ever popular ( at least in my mind ) 404 number. There are links to help the lost ones and a search field. Email entry. Stellar-BlueHas a graphical 404 with an Oops explaination stating the file is not available. A link to the front page for those who have come across this page. Email entry. Planet Dumbass Someplace I can relate too. A graphical 404, well with an interesting light switch. Something to see! Click on the image to go home. Email entry. Moy Yat Ving Tsun Kung Fu Useful 404 page with many links for the lost user. Has "When you control the hands and feet, there are no secrets." from Ving Tsun Kuen Kuit and a classic 404 solgan. Email entry. Simski.org Uses the IE error page format, but with some minor changes. Has links for the lost user. Email entry. Howard Family Home page Dark 404 page with links to help the lost user. Email entry. superpants. A blinking #00000404 error message asking the lost individual to click the left mouse button. This task sends the user to the always changing and very interesting superpants site. Email entry. Okidoki Page states in large letters, huh? Has a graphic of a dog taking a bite out of the page. Hey, I like the dog. Email entry. eluded.orgA large graphical 404 file missing page. Clicking on it will send you back to the front page. Email entry. Frayed Logic Studio Has the classic 404 in graphic format, but burning. Links for the lost user. Email entry. boomis.com Contains the classic 404 with an interesting image. Has list of reason why the 404 may have occurred. bigdarkcloud Has the 404 and an animated homer. Also included is a ticker message from the web server describing its problems. Links for the lost user. Drag Queen for a Day Ahh, hmmm, well, the title speaks for itself. Very helpful page with lots of links for the lost user. Email entry. fragmentary Error page contains the classic 404 number along with a picture of Goji-San, stating "Goji-San says we cannot find your page. Perhaps he has eaten it.. Link to front page for lost user. Email entry. Peugeot Although it does not have the classic 404 on the page, it is there. The following email text for this 404 site explains, " The French carcompany 'Peugeot' names all their carmodels a number of 3 digits with an zero in the middle. So 205, 306, 406 etc. In the past they had an extremely popular model called 404. Needless to say it is featured on the 404-page of the company's website. Email entry. brutal.com Has a bunny that changes position with every hit. Fluttergirl.com Has an image of ashton kutcher stating; "Dude What a Total 404 Bummer! Try Again!" Has the classic 404, and a link for the lost user. Email entry. Trashed.org. Has the classic 404 in the page and in the title. Links to help the lost user. Email entry. Glisten This page has changed. Has simple text on yellow-orange background " 404 oopsie! :)". Email entry. technobastards Has the magical number and an image gears in the background. Links for the lost user. Roswell Online Your Roswell Online Page Has Been Abducted! Like aliens? Then you will like this 404. The 404 is in the title, has classic alien head shot, and a flying spacecraft. Links to help the lost user. Email entry. muted.com Has the classic 404 error message with useful links for the lost user. Also, has a nice image of a country road. Kitsch Postcards A large graphical 404. Contains the number 404, showing a postcard of a couple in 1964 stating that the internet has not been invented yet. Clicking on the image will transport the lost user to the front page. Email entry. The Cat House Large graphical 404 page. Click on the image will return the lost user to the front page. Email entry. HuntingPA.com Has graphical 404 page. Pull down menu and go button to aid the lost user. Keystone background image. Email entry. Zurcworld Large graphic containing 404 message, with graveyard. Links for the lost user. Email entry. CyberSight No 404, but does have a graphic of an old guy having difficulties. Email entry. hunyzsweet dot com No 404 in the page, but tries to help the lost user. Some graphics. Clean page. Rio Salado College Title contains the 404 number. Has animated graphic of building being demolished. Has links and form inputs for the lost ones. Email entry. phaster.com 404 in title. Has image of Homer S. surfing the web for questionable information and paying the price. Links to help the user and a sound file. Email entry. Manufacturer Image and Data Network Animated 404 image, very nice. One link to the main page for the lost user. Email entry. The Motley Fool. Has the classic 404. The page a phrase and varies with each missed hit. Has an explaination of the error and links to help the lost user. Email entry. TahoeNet.com No classic 404. Has a graphic of someone hold a stop sign. Some useful information for the lost user, and an animated advertisement. Email entry. Wanderers Production Corp. Has the 404. 50s looking 404 page, has a graphic of a 57 Chevy and guy with leather coat and sunglasses, and a link to help the user. Email entry. Muppetlabs, Inc. Has a flashing ERROR with the statement; "Citizen: You have committed an error. Remain perfectly still until we arrive to punish you." 404 is in the title bar. Email entry. Mauka Media. Nice layout and graphics, link to front page to those that are lost, and form to send your problems to the webmaster. Email entry. Shattered Illusions Nice clean page, with a black background with blue text. Graphical 404 Not Found. A link for the lost user back to the front page. Schaft's Home Page. Has a graphical 404, animated GIF and a countdown to when the browser will be sent to the main page. Email entry. frontier Global Center. Very graphical, nice layout, has the classic 404, and lots of links to help the lost user. Email entry. Bizform Has the classic 404 included. Graphics, and links to help the lost user. Email entry. www.icesk8.com States that you are Skating On Thin Ice? The Page You Are Looking For Has Slipped Away! The 404 is in the title, graphical, with links for the lost user. Email entry. American Water Works Association Clean, crisp 404 page. Has the classic 404, graphical tool bar to help the lost user. Email entry. Scriptics Corporation. The makers of the TCL/TK language have a "You step in the stream, but the water has moved on. This page is not here" page. No 404, but lots of graphics, links to help the lost surfer, search form and webmaster email link. Slashdot. This Linux news (a great page) page has 404 in the title of the page. Lots of links and a search entry form. Also, at this time, has a borged Bill Gates graphic and many more. Motorcycle City. No 404, but has "An ERROR has occurred in your Application." Explaination of what might have occurred with a CRASHED motorcycle. Toolbar near the bottom of page to help the lost user. Also, take a look at their front page. Nice graphic. Email entry. QuickPages. Has the 404, clean page with graphics, links to help the lost surfer. Email entry. RICA.NET. Is the same 404 as a former month's winner, but with a twist. It has audio file with it from some familiar show. Email entry. The Virtual Times Great 404 sent in, contains the 404, and animated GIFs, and a summit form. Very nice. Email entry. INTRINET. Non-english 404, has the 404, and animated GIF of a PC and MAC fighting. Email entry. Shop Tour 404 page with several graphics, and a 4 OH 4! message. Lots of links to help the lost user/shopper find their way back. Email entry. outtacontext Does not have the classic 404 in page. Does state that you are outtacontext. Links to help the lost user back to the front page. Email entry. Sony Has the classic 404 in graphical format. Search field to help the lost user. Several links and an explanation of what might have happened. Email entry. net-a-car Has the 404 error in the title area. Several graphics of cars and links to help the lost user. Email entry. C&M Cybertailers. No classic 404. Space background with a Star Trek theme. Has a page counter and a some music to console the lost traveler! Email entry. FAMU-FSU College of Engineering Home. Does not have the classic 404. Does have animated eyes, links to get you going elsewhere, and tells you what has happened. Email entry. Minnesota Pollution Control Agency Has a graphical 404 not found. Lots of useful graphics, buttons, logos and a form search entry to help the lost surfer. Email entry. Winternet Lots of graphics, helpful icons links to other places through the page, search engine entry forms to search the internet. Email entry. Megasoft Development A graphical 404 message of a spider on a web. Has the error message is several different languages. R/C Airplanes NET. Has the classic 404 with some graphics. Email entry. RAT.ORG States, "Maybe Dingo ran off with it?". No classic 404. Email entry. CarverSolutions.Com Has the 404 and a comic book character yelling "File Not Found." Email entry. Feist Has a graphical 404, with an old man chained to a wall. Looks sorta Pythonish. Some helpful links to help the lost traveler. Email entry. UExpress. No classic 404 in page, just an AAIIYEEE! You have reached this page in error.. Helpful links for the lost user and a banner ad. Email entry. sweetessence Simple text 404 page, has 404 in page and states, The number you have dialed is not in service. Please check the number and try your call again. If you need help, hang up and then dial your operator. Has useful links to help the lost user. Clan Orko Rocks Gnads No 404, but its something you will need to read. Very interesting. Email entry. U.S. Coast Guard Has an error 404, and alot of useful links and a search field to help the misguided user find their way. Very useful. Email entry. Weirdo.net. Has the 404. Thought that, as the name states, that it would be a weird 404. But nice looking, with several links to help the lost explorer. Email entry. Net-Connect LTD. Has the classic 404, lists your lost page, graphics, and some helpful links. Email entry. Golden Triangle Online. Has the 404 and is mostly graphics. Email entry. The Avery Group. Sends the lost user to a 403 error page? There is a 404 page on this site as well. Either way, the user has a form that they can fill out describing the problems they are having, and several links. Email entry. Underground Music Source No 404, but there is a Whoops! Logo graphic and link to main page. Nashville.Net Does contain the classic 404 message. Has some useful links to the real page. Email entry. Nintendo No 404, but there is a Not Found. Several graphics, link to a site map, and help. Email entry. Tech Head Computers, Inc. Contains the 404. Has several graphics and helpful links back out to their homepage. Email submission. FutureNet Very graphical and nice looking page! No 404, but a great Oops! Compulink Information eXchange. Has the classic 404. Also contains links to help the user out and a form entry to search the internet via all the popular search engines. Email submission. MyGale. Nice flaming 404, several graphics, looks to be in French, lots of links to help the lost traveler, and if you wait 30 seconds it will forward you to the front page of the homepage. Email submission. 3Com. Lots of buttons and links to help the lost user find their way. Includes the classic 404 File Not Found in graphical form. Nice. Email submission. The Brunching Shuttlecocks. No 404. Has a text message with a long winded, funny, apology. Email submission. Eskimo North No 404, but a File not found. Lots and lots of links for the lost user. Email submission. AngelFire. No 404. Contains ads, even a popup one, and links to help the lost user. Email submission. WCLT Has a colorful 404 page with the 404 included. The ISC Homepage, Texas A&M University. Has the classic 404, some helpful text and graphics. Email submission. Spin the Web - ISP No 404. But has a cute picture of a dog stating that you file was not found. Email submission. SuperNet No 404. Very informative error page with a lot of text to help the user. Some graphics and links. Email submission. KVSC Has the classic 404. Some graphics, information, and links to get you going. Email entry. VISI.COM No classic 404. Very nice looking page with graphics, information about what the user may have done to get this page, and links to help you out. Email entry. Channel 4000 No 404. Has several graphics, and menus to help the lost individual. Even a search feature. Email entry. Punkbiatch. Has a Graphical 404. Email entry. OZCRAFT.COM Has 404 Error - File Not Found Oh no! Someone's stolen this page! Colorful background with some graphics. Contain links to help the user get to where they were suppose to be going. Email submission. Official Letters to Cleo Homepage! One smiley graphic, no 404 but instead uses a rare Don't Panic. Email submission. Scuba Duba. Has the 404 in the title. One graphic to click on, and some text try and help the user. Email submission. Get a Life. Has all the makings of a good 404, but when put to the booger.html test, another page is displayed. Email submission. University of Michigan Email submission. Penn State Great Valley School of Graduate Professional Studies. Has the 404 in the title. Some useful links. Email submission. Federation of American Scientists 404 shown in the title, a graphic and some interesting reading. Email submission. Jacksonville State University Points the user to a different page than the one requested. This page is very clean and colorful, even has graphics and a background. Prudential No 404. A graphic or two. One link to the front page and another to the copyright message. Email submission. Teleport Internet Service Has the 404! A graphic and some text explaining your problem. Email submission. xochipilli.com. Has the classic 404 with a simple graphic. Email submission. Illuminati Online Does contain a 404 Not Found in the title bar and File Not found in the text. Contains one graphic. Interesting URL, same name as my cat, IO. Email submission. Dialspace. No 404, but has a Page not found. This is different. Contains some graphics and a useful menu to help you get back to the main page. Email submission. AOL. No 404, but several helpful links and graphics. Email submission. Kodak. Site will redirect you to another page with a nice graphics and links to help ya out. Email submission. VuurWerk A background image, links, color and the 404! DejaNews Kinda colorful and has the classic 404 there as well! Blacksburg Electronic Village Nice Calvin image and the classic 404. Demon Internet Contains that magical 404. Has a graphic. PBS No 404, just a Whoops! Has a logo graphic and some color. Email entry. catalog.uexpress.com No 404, just transports you to their main site. Email submission. Chez A French site. I don't know what it says, but here it is. Oh yeah, no 404. Email submission. ActiVision. Has a few graphics, but no classic 404. Email submission. Virtual Avenue No 404. Kinda plain with on animated graphic. Email submission. WC3. Has a 404 Error. Very plain with one graphic. Email submission. WWHY PBS Philadelphia Graphics that states Document Not Found, no 404. Email submission. Welcome to the White House. Yes this is, the White House. One bar graphic of a star and bars. Instead of the classic 404, you get "Greetings. May I help you?" with a link. Email submission. internet.com page. One graphic, large 404 displayed. Email submission. Wilmington WWW Nice picture but no 404. Macromedia No 404. Advertising graphics, some color but was expecting to be shocked! PCWorldColorful but no 404, only an OOPs! MacWorld A File Not Found error with some color and a graphic. Acclaimed Web Marketing & Design No 404. Has color in background and text. Email submission. Apple No 404, sort of useful. Yahoo No 404, some graphics but overall, boring. IBM No 404, one graphic. Clemson No 404, one graphic. Dull. ZDNET No 404, only a sorry. Some graphics and a menu. HARRIS Semiconductor, Mountaintop No 404. Colorful and informative with links. California Home Page Useful, and some color but no classic 404. Weather Channel A sorry with helpful text and links to navigate. Pretty good. Ford New Zealand No graphics, and the classic 404 in small print? Why oh why. Email entry. MTV3 Internet Not Found but in a different language. USERS.pullman.COM Another classic 404 error. Email entry. University of Ljubljana, Faculty of Mathematics and Physics. A classic, love the classics. Email entry. Texas Rangers Baseball. Classic page. 404 is in the title bar. Email entry. IARC.COM 404 URL Not Found, The specified URL cannot be located on this server. Microsoft Classic 404 but boring. Standford Has 404 but is dull.